Book a Lynnhaven Inlet charter boat! Located at the far northern end of Virginia Beach’s resort area, the inlet hosts a loose mix of marinas, restaurants and charter boats that specialize in fishing the Chesapeake Bay and Virginia Beach’s inshore and offshore waters. It’s a very short boat ride away from the Chesapeake Bay Bridge Tunnel (CBBT) fishing grounds. The captains who fish out of this inlet are experts at putting anglers on Stripers, Bluefish, Flounder, as well as the other fish that call the Bay and inshore waters home. Experience the best fishing Virginia Beach has to offer with Capt. Steve Wray. The Chesapeake Bay as well as the adjacent offshore waters of Virginia makes up one of the most spectacular fisheries in the world! Those who have had the opportunity to fish this special place feel fortunate. Virginia Beach has one of the largest fish attracting devices in the world, the Chesapeake Bay Bridge Tunnel Complex. Add to that the offshore towers, the ship wrecks and the relatively short run to the Gulf Stream, you quickly realize why Virginia Beach is considered one of the best places on the East Coast to fish! Book a Lynnhaven Inlet charter! Want to go where the fish are? Want to go on a gorgeous nature tour? Want to have fun with family and friends? Angling or expeditions, First Landing Charters is the way to go. There’s so much to see and do here in Coastal Virginia. 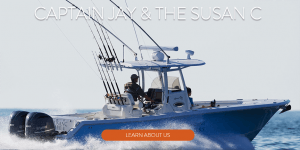 With Captain Jay Leach on the Susan C., you can experience it from the water, one of the best ways to enjoy the many adventures this area offers. First Landing Charters is truly your first choice. They call the coast of Virginia the “fish highway” due to the migration of so many species of fish. Different fish match different seasons, so there’s always something great to catch. What type of fishing do you like? Bottom, drift, wrecks, casting, trolling or offshore, First Landing Charters can accommodate your interests and budget.